Łowiczanie Polish Folk Ensemble, resident dance group of The Polish Club in San Francisco, performs throughout southern Poland during July 2011, dancing 22 times in 25 days. The tour was developed and is managed by Mary Kay Stuvland, choreographer and artistic director of Łowiczanie, and features 30 dancers, singers and musicians, and several tour assistants. Łowiczanie is joined in this tour production by a number of performers and support staff of the Polish Dancing Group Lajkonik of Tucson. Łowiczanie will produce a documentary film in 2012 of its experiences. While in Kraków, Mary Kay Stuvland will meet with Antoni Bartosz, Director of the Ethnographic Museum in Kraków, to discuss, among other topics, a possible folk costume exhibition in San Francisco that will include items from Kraków's Ethnographic Museum, to be co-sponsored by the San Francisco-Kraków Sister Cities Association. Ms. Stuvland and several representatives from Łowiczanie Polish Folk Ensemble attended the closing reception of the 2011 Jewish Culture Festival in Kraków, at the invitation of Shana Penn, Executive Director of Taube Philanthropies. Also in attendance at the closing reception was Agnieszka Rudzińska, Director of Warsaw's new Museum of the History of Polish Jews. Her meeting with Mary Kay sparked an invitation to Łowiczanie to return to Poland next year to participate in the "warming up" series of eclectic artistic events, currently in the planning stages, which are to precede the formal opening of the museum's exhibitions in 2013. Łowiczanie returns to Kraków as guests of the mayor's office on July 19th, and performs a full concert of both its Polish and American repertoire at the Nowa Huta Cultural Center on Wednesday, July 20th at 5:00 PM. All arrangements requested by Łowiczanie (a founding member of the San Francisco-Kraków Sister Cities Association) for the ensemble's events and meetings of its artistic director in Kraków were supported by the efforts of Agata Mierzyńska of the Kraków Mayor's Office, Bureau of International Relations. On Thursday, July 7th, Łowiczanie will present on tour its first full concert of music, song and dance in the Cultural House of Myszków at 7:00 PM. On Friday, July 8th, Łowiczanie continues the ensemble's travels and performances with full participation in the "Świat pod Kyczerą," one of the largest international folklore festivals in Europe. This 11-day event represents more than 20 towns and villages in Lower Silesia, Lesser Poland and the border town of Kurov in Slovakia. Following the Kraków residency, July 19th & 20th, Łowiczanie performs Thursday, July 21st at the 15th Polish World Folk Festival in Rzeszów. This is Łowiczanie's fourth appearance in an exciting week-long event attended by approximately 1500 performers from 43 Polish ensembles from throughout the world. Łowiczanie is proud to have been selected from over 60 ensembles, and will present four Polish folklore choreographies. 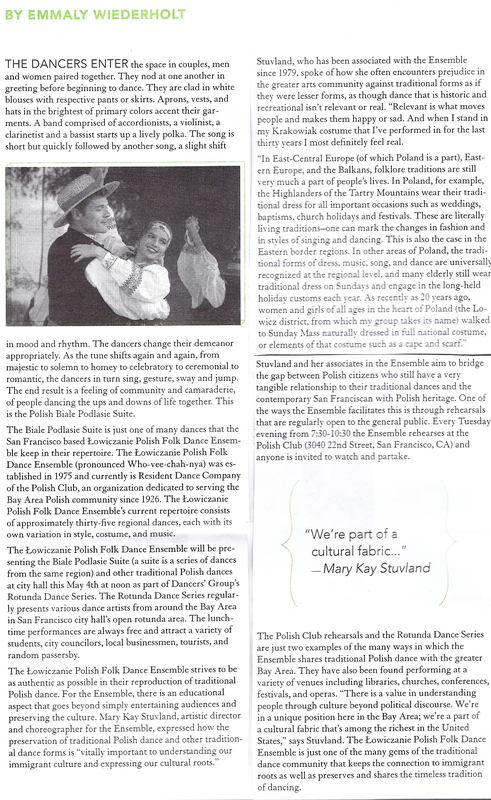 Mary Kay Stuvland's Polish choreographies ("Songs & Dances from Biale Podlasie,” recently performed at the San Francisco Ethnic Dance Festival and "Songs & Dances from Spisz") are augmented by the premiere of her American choreography, "Early Jazz Era," to be danced in Rzeszów and surrounding towns. 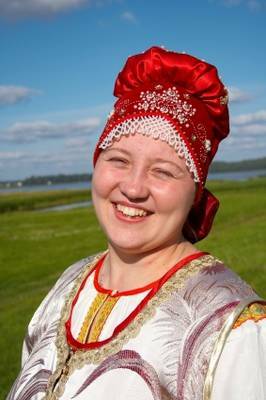 Łowiczanie's volunteers and professionals created the new women's costumes for Białe Podlasie, as well as for "Jazz."